In the last sections of Archaeology, Foucault situates his methodology for historical analysis as archaeology by outlining a process for describing discourse. Foucault is careful to distinguish his method as different from a history of ideas (an approach which it closely resembles) by characterizing its distinct factors–primarily its reliance on description rather than a tracing of origins, intent, or meaning. Describing discourse, Foucault posits, begins with describing statements, which are the most basic units of discourse. The concept of a statement as Foucault uses it is difficult to understand because of our previous associations of statements as sentences, linguistic constructions, or acts of speech (perhaps examples of the unities he persuades us to let go of in the first two sections of the book). Foucault’s statements, however, refer to something less concrete, something that is simultaneously visible and invisible–they serve as functions rather than as things. As such, they have no unifying rules, rather their rules of construction are constituted by the institutions, subjects, and fields (enunciated functions) by which they are formed. The relations between statements, then, allow for discursive formations. Foucault is clear (or as clear as he can be) that his approach to historical (really, discourse in this situation) analysis is descriptive. This description is more concerned with statements’ conditions of existence, perseverance, and disappearance than it is with their signified meanings and subject intent (SparkNotes, p. 47). In this section, I bring forward several of Foucault’s claims to support one discussion/example that helped me understand the approach a little better. 1. Foucault is insistent that we consider the subject not on an individual level but on a level with discourse (which, as we know, is the system of statements within an associated field). As such, the subject’s authority is based not on his/her own expertise, rather it is based on the expertise of his/her role in the field. 2. Foucault points to the importance of rarity for the archaeological approach. Rather than considering statements as frequent, common events, Foucault emphasizes recognizing the rarity of circumstances surrounding each statement. While the opportunities for statements are endless, each condition of emergence is unique. 3. The principle of repeatable materiality explains that a set of signs can be repeated if its identity is based on non-material factors (such as grammar) but cannot be repeated if its identity is gained through material factors (such as institutions). Something of a synthesis: These claims together help me understand how a concept can be both visible and invisible at the same time–how they serve as functions in discourse rather than as signifiers of meaning. For example, if we take the statement “mistakes were made” in two different scenarios, we’ll see how they maintain identity through the linguistic structure but not through the materiality of construction. Scenario 1: Politicians frequently use the phrase “mistakes were made.” While my first inclination is to resort to why (the subject’s intent), Foucault’s approach asks us to describe the conditions in which the statement emerged. Why this statement and not another? How does it function in the situation? How does it differ temporally from one politician’s use of it to another’s? Scenario 2: In order to teach passive voice to her ENG 101 students, an instructor uses the statement “mistakes were made.” Although I’ve already introduced intent (because it’s so hard not to! ), asking the same questions above will produce different answers, thereby revealing a different set of conditions of emergence for the statement. I’m still having a difficult time articulating the terms, so I’ve pulled definitions from Foucault, SparkNotes, and a Michel Foucault website. Links to SparkNotes and the website are provided in the References Section. Archaeology: “Archaeology is about examining the discursive traces and orders left by the past in order to write a ‘history of the present’. In other words archaeology is about looking at history as a way of understanding the processes that have led to what we are today” (O’Farrell). Archive: “A particular level: that of a practice that causes a multiplicity of statements to emerge as so many regular events, as so many things to be dealt with and manipulated. [. . .] It is the general system of the formation and transformation of statements” (Foucault, p. 130). “Designates the collection of all material traces left behind by a particular historical period and culture. In examining these traces one can deduce the historical a priori of the period and then if one is looking at science, one can deduce the episteme of the period. None of these concepts has predictive value – they are all descriptions of limited historical orders” (O’Farrell). Discursive Formation: “A discursive formation [. . .] presents the principle of articulation between a series of discursive events and other series of events, transformations, mutations, and processes” (Foucault, p. 74). “The discursive formation is roughly equivalent to a scientific discipline” (O’Farrell). Discursive Practice: “This term refers to a historically and culturally specific set of rules for organizing and producing different forms of knowledge. It is not a matter of external determinations being imposed on people’s thought, rather it is a matter of rules which, a bit like the grammar of a language, allow certain statements to be made” (Michel-foucault.com). Enunciation: “The discursive conditions under which (a statement) could be said, rather than the grammatical, propositional, or strictly material conditions under which it could be formulated. Thus, an enunciation always involves aposition from which something is said; this position is not defined by a psychology, but by its place within (and its effect on) a field of discourse in all its complexity” (Sparknotes, p. 13). Enunciative Function:”Designates that aspect of language by which statements relate to other statements” (Sparknotes, p. 13). Episteme: “Refers to the orderly ‘unconscious’ structures underlying the production of scientific knowledge in a particular time and place. It is the ‘epistemological field’ which forms the conditions of possibility for knowledge in a given time and place” (O’Farrell). Historical a Priori: “This is the order underlying any given culture at any given period of history. 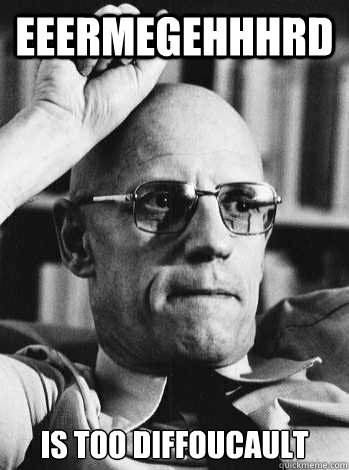 Foucault also uses the phrase the ‘positive unconscious of knowledge’ to refer to the same idea. The episteme which describes scientific forms of knowledge is a subset of this” (O’Farrell). Material Repeatability: “A defining characteristic of the statement. It is also a kind of paradox: if we identify a single statement solely on the basis of its specific material existence, that statement will never be truly repeatable (it will be a different statement with each new articulation); but if we identify a statement solely on the basis of what it ’means’ (i.e., its propositional content), that statement can be repeated ad infinitum, without regard to the differences in its material, time-space coordinates” (Sparknotes, p. 14). Non-discursive Practices: “including ‘institutions, political events, economic practices and processes’ (p.162). He also argues that discourse does not underlie all cultural forms. Forms such as art and music are not discursive. He also notes: ‘there is nothing to be gained from describing this autonomous layer of discourses unless one can relate it to other layers, practices, institutions, social relations, political relations, and so on. It is that relationship which has always intrigued me’” (O’Farrell). Statement: The most basic unit of discourse which does not, however, contains not basic unit. Rather than a thing, we can thing of a statement as a “unique method for the analysis of sets of signs” (Sparknotes, p. 45). Subject: “The subject is an entity which is self-aware and capable of choosing how to act. Foucault was consistently opposed to nineteenth century and phenomenological notions of a universal and timeless subject which was at the source of how one made sense of the world, and which was the foundation of all thought and action. The problem with this conception of the subject according to Foucault and other thinkers in the 1960s, was that it fixed the status quo and attached people to specific identities that could never be changed” (O’Farrell). Outline of Archaeology of Knowledge: If you’re a person of linear thought like me, you’ll appreciate this detailed outline of the entire book. I appreciate that it breaks each section down into the primary concepts. Summary by Section: This is an easy-to-understand summary by section. Detailed Summary: This more detailed summary by SparkNotes also offers analysis for each chapter. Additionally, you can find explanations of key terms and concepts. Network Archaeology: I don’t know if we’re ready to make these kinds of jumps, yet, but this could be an interesting site for us to look through. There may be resources for those working on digital networks. Foucault, M. Archaeology of knowledge.